Pepper steak is an American dish with some Asian flavors, and it's a comfort food for many. Typically, a pepper steak dish includes stir-fried slices of beef steak, green and red bell peppers, and seasonings. The classic version of the sauce often includes soy sauce, ginger, and cornstarch for thickening. Pepper steak is a delicious entree from the Fujian region of China. Originally, the dish was made with pork and light seasoning, but now it can include additions of sliced onions and bean sprouts. This Chinese-American dish dates from the mid-1900s and can be paired with sides like noodles, cauliflower, quinoa, roasted potatoes, or rice (the latter of which is included below). Various versions of pepper steak can be found in Korean, Japanese, and French cuisine. This easy pepper steak recipe is quick to fix, tasty, and doesn't put a strain on the budget. Ingredients include round steak or lean chuck steak, garlic, green onion, peppers, celery, tomatoes, seasonings, and more. Cut the beef across the grain into thin strips, about 1/8-inch thick. In a medium bowl, combine the soy sauce, garlic, ginger. Add beef. Toss and set aside. Heat oil in a large skillet or wok. Add the beef and cook, stirring constantly, over high heat until browned. Check the meat for tenderness. If the meat is still tough, cover and simmer for 20 to 30 minutes longer over low heat. Turn the heat up and add vegetables. Cook, stirring, until vegetables are tender but still crisp, for about 10 minutes. Whisk the cornstarch into the water until smooth and add to skillet. Cook and stir until the mixture is thickened. Add the tomatoes and heat through. Spoon the beef and pepper mixture over hot cooked rice and garnish with parsley or sliced green onion tops, if desired. Serves 4. Add about 4 ounces of sliced mushrooms along with the bell pepper and onion. Alternatively, add drained canned mushrooms along with the tomatoes. Replace the green onions with sliced sweet or yellow onion. Add 1 to 2 teaspoons of brown sugar or granulated sugar along with the water and cornstarch mixture. Replace the fresh minced garlic with 1/2 teaspoon of garlic powder. 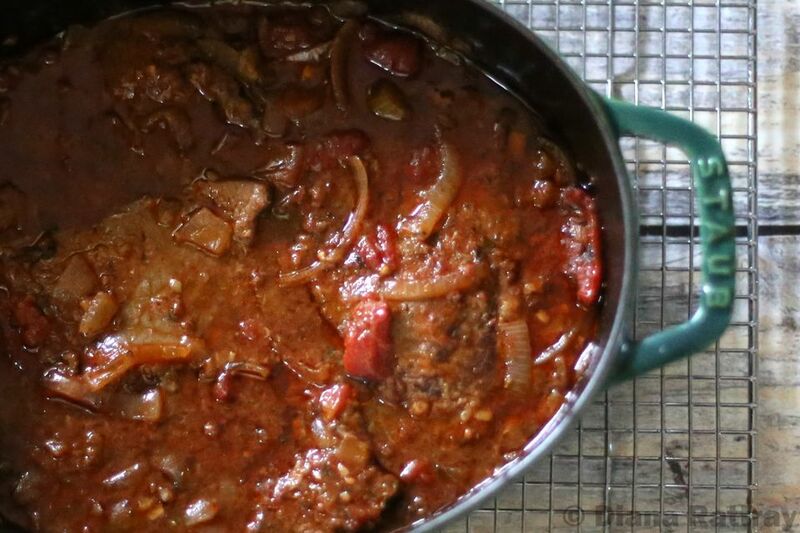 Basic Swiss Steak: This simple Swiss steak is served with tomato sauce, mashed potatoes or rice, and a green vegetable like green beans or broccoli. Pepper Steaks with Sirloin Tips: Whether you're a rice or noodles person, this delicious sirloin tips recipe brings the right amount of flavor to your dish. Round Steak in Gravy: If you're a fan of the slow cooker, this creamy gravy recipe will add some extra flavor and texture to your steak. Skillet Swiss Steak: Those in the mood for an Italian dish can skip the veal, eggplant, or chicken Parmesan and go straight for the steak.